Once a quarter SalesLoft sets aside a few of days for the product and engineering teams to work on whatever they want. Usually, I’ll join an engineering project that needs a designer. But for our most recent engineering day I decided to work on something a bit different. Each product delivery team at SalesLoft has their own unique name. During engineering days this year I decided to work on custom badges for my teams: License to Trill and Cores Light. 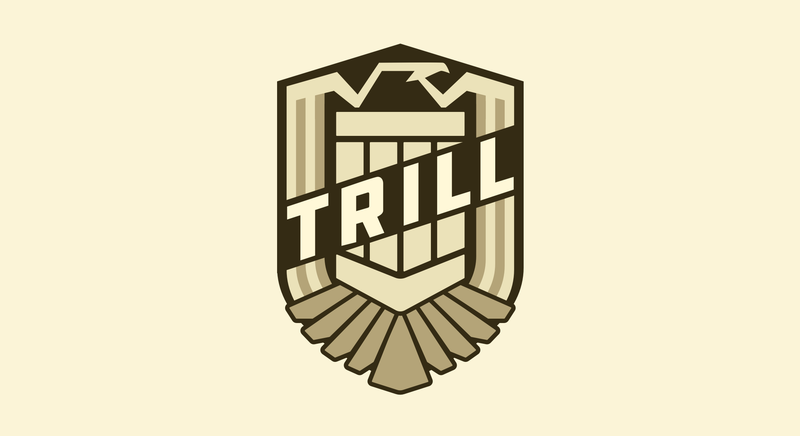 I designed the eagle badge featured here for License to Trill. Trill is a slang term for meaning true and real. It was a bit of a struggle to come up with a visual concept for that. It was just too broad. Another approach would be to design some sort of license. Early iterations were of a sheriff’s badge. You know the pointy stars with blocky letters. I wasn’t happy with any of the designs. The next concept was something like an agency emblem—think NSA, CIA. Those turned out better, but the concept wasn’t there. My co-worker Justin suggested we base it off a badass-looking badge—something like Judge Dredd’s badge. I thought it was a fantastic idea. It was a bit of a surprise how many good color combinations I was able to come up with. The top row contains a single base color with darker and lighter versions of that color. The bottom row contains one dark, one light and one accent color. Of the single-color badges, the ones in the top right were the overwhelming favorites because the gold-ish and silver colors mimicked a real badge. Of those the gold one was everyone’s favorite. Of the accent colors people liked the red and blue one on the far left, the peach and blue and the dark green and navy. In the end we went with the gold one, and I think it was the right choice. As a bonus I’ve got some cool color palettes for another project. The main reason everybody wants a badge is for the stickers. I’m not a sticker person myself, but many at the company see them as an accomplishment—it shows that you’ve been around and are a veteran engineer or product person. Anyways, designing something other than interfaces was a nice change of pace. Only now every team wants me to design some sort of badge for them. Maybe during our next engineering days. And if you’re looking for a new gig, come design stickers (or interfaces) with me. SalesLoft is hiring. It is an awesome badge! Newsletter with links to things that I'm writing. Never more than once a month. Copyright © Sam Solomon 2019.